The starting point for this project was a cramped cold bungalow with a large south facing garden and a magnificient pohutakawa. The concept was the addition of a living box - a large light and calm volume. The scale of the addition is balanced by the pohutakawa. The existing bungalow is given over to bedrooms and offices. 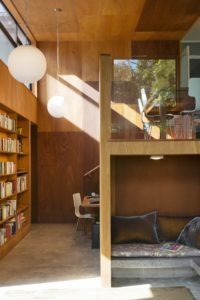 The living box is set down three steps from the existing house level, which places the room a gentle distance above the garden. The deck floats as a light platform adjacent to the pohutakawa. 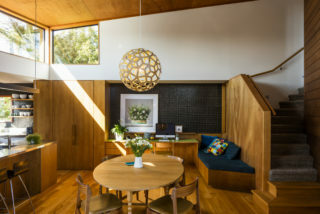 The room is fully glazed along the west side – the pohutakawa providing sufficient shading from summer afternoon sun. Large sliding doors can be opened variously. The ceiling rakes up to provide a continuous north-facing window above the kitchen. This ensures the room has a lovely light quality, despite its location on the south side of the bungalow. The theatrical gesture above the kitchen seems appropriate in this house for a well-known chef where the kitchen and its output occupy centre stage.